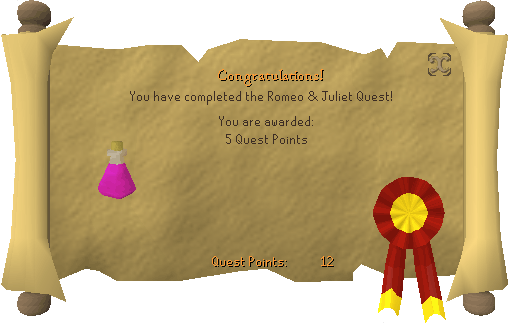 Romeo and Juliet was removed from RuneScape on 21 September 2010, and it was replaced with Gunnar's Ground. This content serves only as a historical reference. 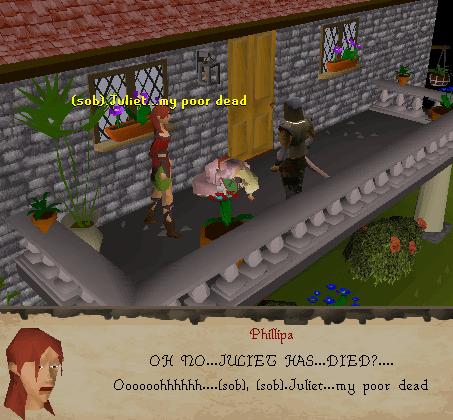 Talk to Juliet in her house in west Varrock. 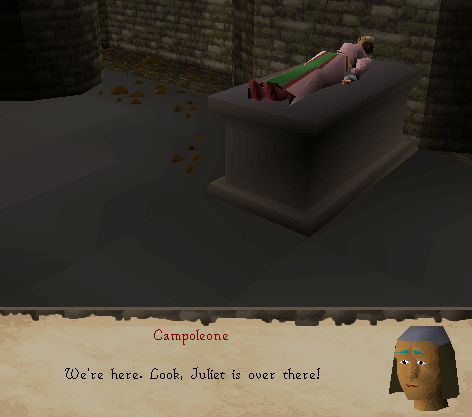 Firstly, talk to Juliet upstairs in her house in west Varrock, just past the Bank. She tells you that she's in love with Romeo and asks if you've seen him. Tell her that you have, and she will give you a Message to give to him. Romeo can usually be found in Varrock Square, wandering around near the large fountain. When you talk to Romeo, you find that he's quite upset over Juliet. Give him the Message that Juliet gave to you, and he tells you that Juliet's father doesn't want them to get married, and if he sees Romeo, he will kill him. Romeo also says that Father Lawrence may be able to help them with their problem. Father Lawrence can be found in the local Varrock Church, a short distance from Romeo. Go east along the road and then head north past the small fountain to find the Church. Talk to Father Lawrence and a cut-scene will follow. Now go back to the center of Varrock, and then head south past the Clothes Shop. Just west of the Sword Shop is a small house, home to the Apothecary. Talk to him about making the potion, and he says that you need some Cadava Berries. You can find these in the woods just east of the Stone Circle, and after picking up 1 bunch, bring them back to the Apothecary to make the Cadava Potion. Head back to Juliet and give her the potion. Once again a cut-scene where you see Juliet drink the potion and fall into a coma. Phillipa does some acting which brings Juliet's father, Draul Leptoc, to the balcony. Now head back to Romeo and talk to him. He will ask you to accompany him to the crypt, apparently he is not a great hero. 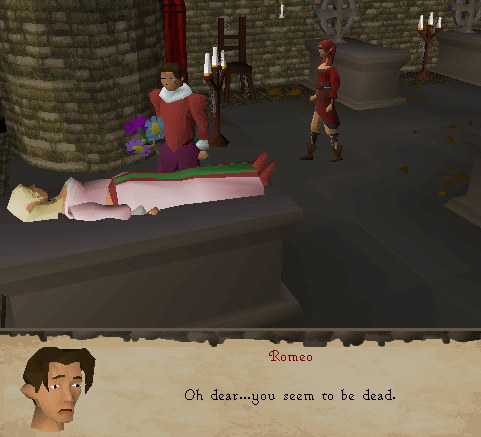 Once again, a cut-scene is shown where you will take Romeo by the hand to show him to Juliet.